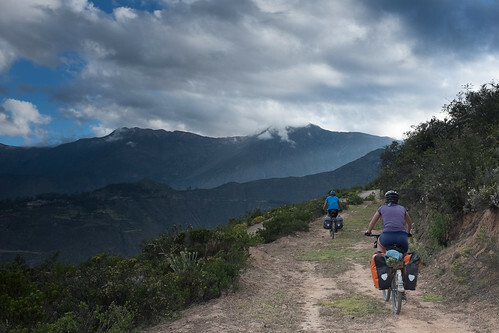 In my previous post I explained the thought processes that had led to wanting to ride in a different way, to experience fully the mountains of Peru, and how this would only be possible with less of a load to lug around. 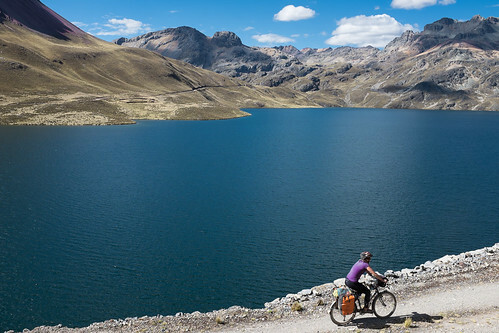 We’d spent so much time in Huaraz talking about all of this, to the point there was nothing left to do but get out there and ride. 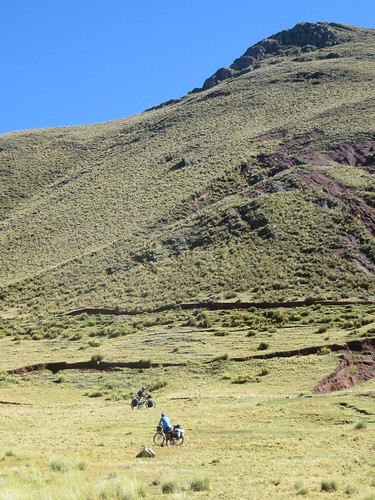 We would be following The Pikes on Bikes directions of The Great Peru Divide. 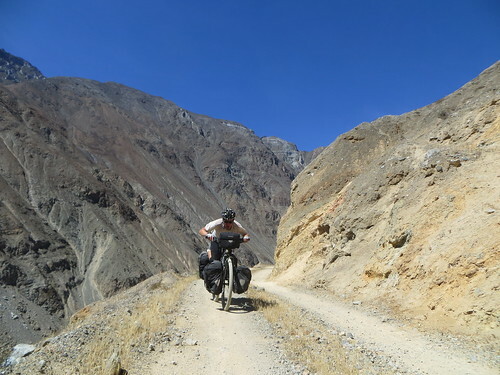 This British couple have been blazing remote trails across the Andes for a number of years now, and it would only be on completing some of their routes how I would really begin to appreciate how tough these guys are, and how much work they have put in to producing route instructions so that people like me can just go off and ride in the wildness without too much planning. 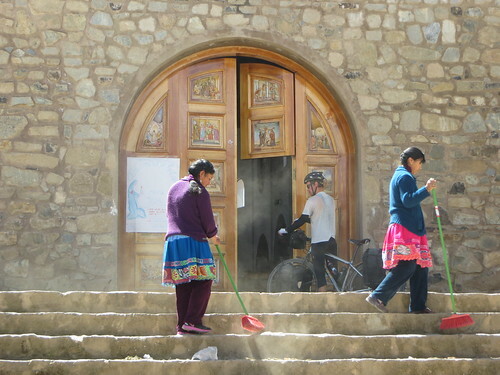 It felt as though they were effectively holding our hands through some pretty tough and sometimes gnarly riding, telling us when to fill our water bottles at waterfalls and rivers, and what amenities lay ahead in the villages, so we knew when to stock up on food, and where we could stay. 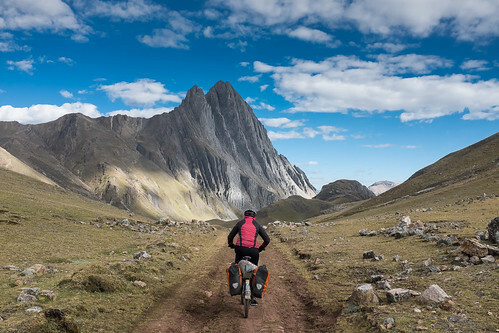 Check out Andes by Bikes for all of their mapped routes. 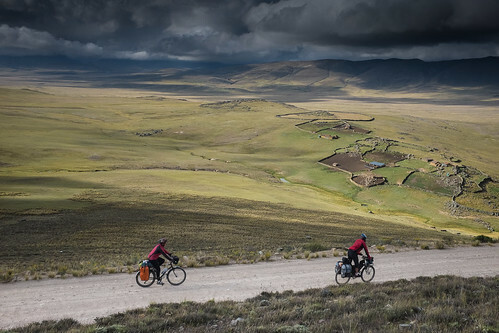 I am a girl from the Cambridgeshire Fenlands, big skies and fast riding miles – incredibly surreal then that I find myself embedded both physically and psychologically in these mountains, where riding on a flat is something never pondered. These mountains are so vast it feel as though they go on forever and exist in forms beyond my imagination. It’s as if a giant piece of paper was been scrunched up, and then incredibly half halfheartedly unfolded; we exist riding in the middle of the scrunch like tiny pieces of dust, nothing more. 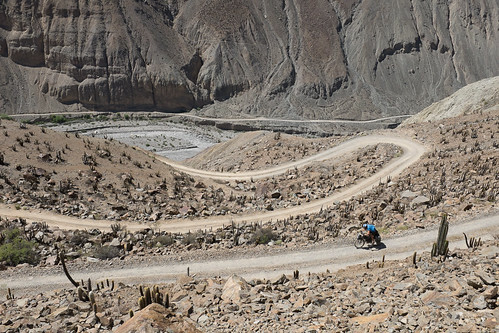 As one cyclist so aptly wrote, we are in the guts of Peru. 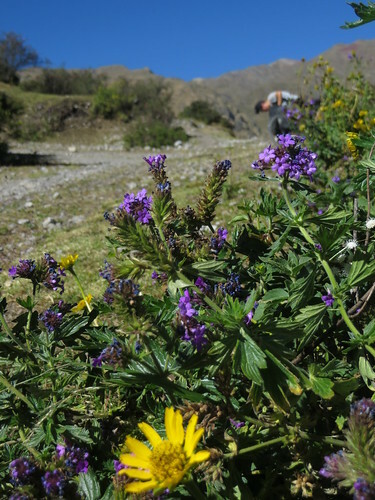 Back in Huaraz after the loop of the Huascaran National Park, we made our preparations for the trails ahead. Travelling light meant that we gave each other gear inspections, and the stuff we didn’t need would be sent on to Ayacucho. Jo Jo left a few days before us, heading downhill to the coast. We didn’t set off early, we’d been to the bus station to send our stuff on and done the usual faffing which comes with leaving a place after a while. 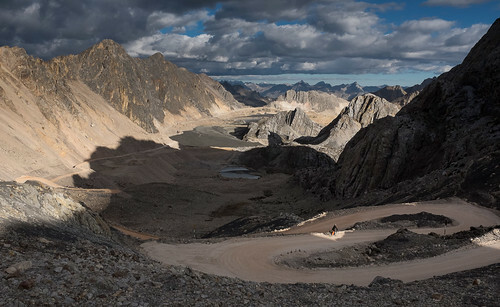 We’d done so much talking about the route, about the kit, and our preparations, and so it was pretty thrilling to be on the road, this time with a new group, a lighter load, and another big adventure beneath the skies. 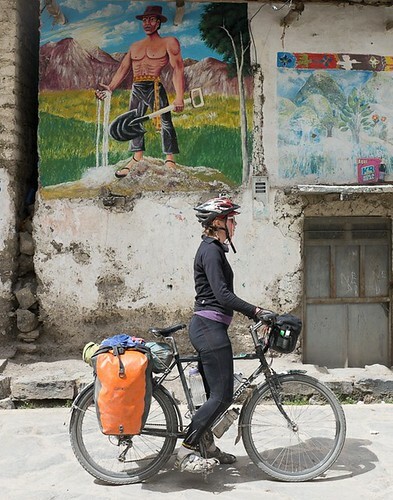 I was slightly apprehensive too, it would be a tough challenge and I would not be the strongest cyclist of the group, I wasn’t carrying the map or taking charge like is in my usual nature. 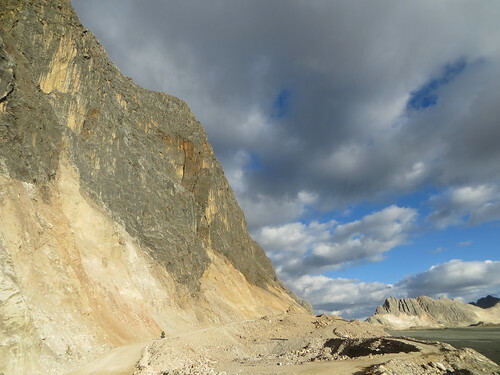 I knew the route would be tough, but I decided not to read accounts online, I can’t think of a better type of surprise than viewing incredible landscapes for the first time. 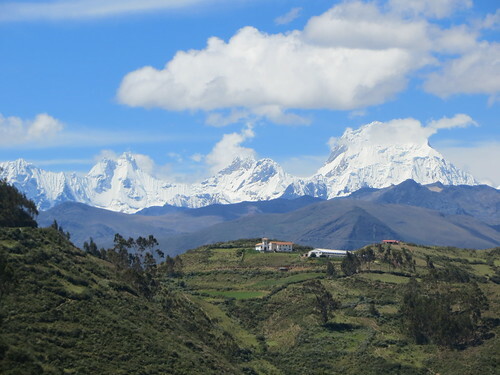 There wasn’t much traffic to get out of Huaraz, still there wasn’t a lot to see, a steady incline and as Nathan would say, pure utility miles. We found a place to camp below a road side restaurant, next to a river. 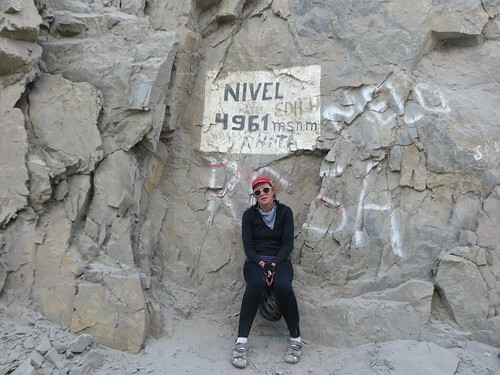 Here we ate incredibly greasy eggs and rice, there was a sort of anticipatory mood that night, we were happy to be out of Huaraz but anxious for the real adventure to begin. That morning I realised what an organised camper Nathan was- all his food is stored in zip lock bags, he even has a case for his coffee mug, and a a little shovel for digging a toilet hole. 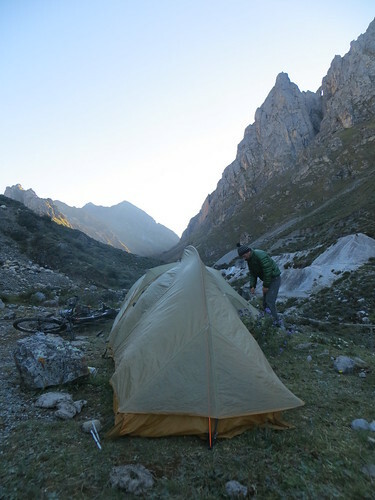 We’d slept in a valley and had to wait around for the sun to hit our camp so that our tents could dry before our tents could dry so we could hit the road. 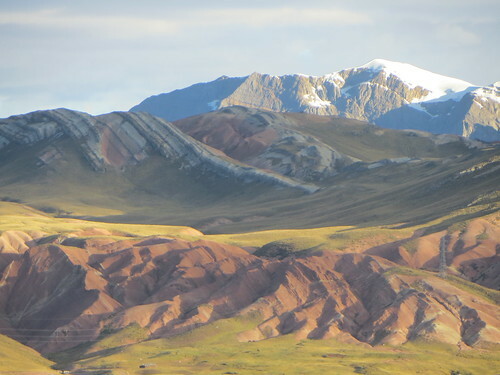 Here we caught our first views of the snowy Huaywash mountains (famed from the film Touching the Void), the mountain range we skirting the edge of for the coming week or so. 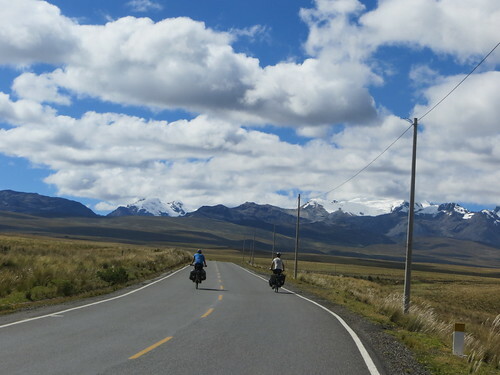 We powered on to Laguna Conococha, here was a crossroads, from here it is possible to head to the coast, or to the east of the country, we were not taking either of these routes but a dirt track heading south, and so the adventure would really begin. This place was lined with restaurants offering the same food, and all selling gigantic wheels of cheeses. We bought one of the cheeses would feed us for about 3 days. 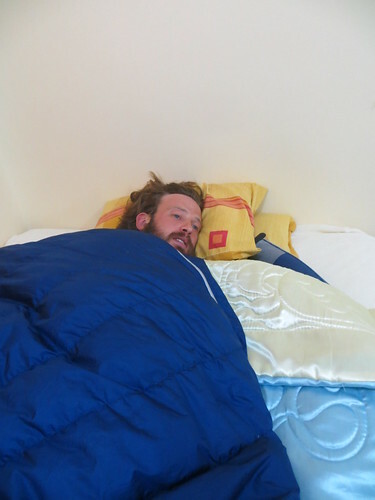 Nathan was still recovering from a chest infection and a month off the road so was obviously weak, but once we got on the ripio it was like he was a different person, he was back where he belonged. Progress that afternoon was slow due to all 3 of us having to stop every 2 minutes to take photos, and things never really changed from that point in. We found a place to camp next to a sheep dipping pen. 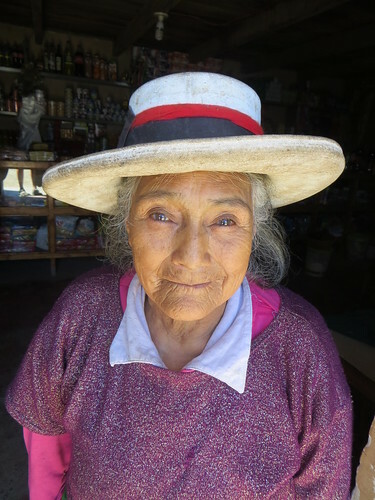 The campesino who lived on the land welcomed us to sleep indoors, but those mud houses are never much warmer than outdoors, plus we were excited to make a camp. Maxamilian had the biggest smile, and plenty questions about our home countries. The moment that these smiles stop warming my heart it’s time to go home. Spurred on by acquiring a cauliflower I set about making the hugely ambitious camp stove dinner of cauliflower cheese, I’d attempted to substitute too many ingredients for one another and it didn’t work out, but still we ate a concoction of cheese cauliflower and pasta. 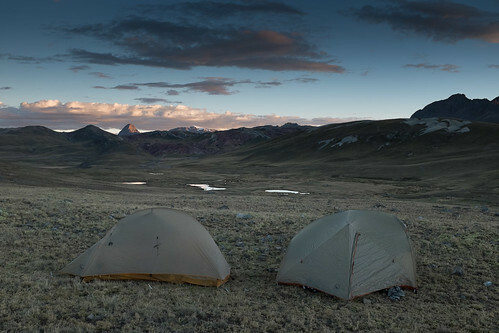 That night I slept at the highest altitude of my life, and it was my first night camping in freezing temperatures. At the time it felt like real survival, but now, just a few weeks in I’ve camped so much colder and so much higher, and I’ve become so accustomed. We headed down hill to the quiet village of Ticllos. The police men were stood around looking bored and took our details in an attempt to look official. This was another village under the Italian Mato Grosso ministry, I snooped around the church, admiring that typical Mato Grosso carpentry and watching a truck load of Italian pasata get loaded into the church. The Italians may not be embracing the local food culture as we have to, but this was to our advantage when we were invited in for espresso and fresh bread and jam. The priest had been there for over 20 years, and the group was made up for 5 Italians, so a lot smaller than the 60+ in Chacas. Before we realised it was 12pm and the boys bike computers told them we’d only done 45 mins of cycling (down hill) that day, so we thought we’d better hit the road. I understand why the Italians want to set up churches here, the views of the Huaywash were spectacular and the air so fresh, babbling brooks followed our road out of the village. Down and up, down and up, keeping us on our toes and we arrived in Rajan as it was getting dark, and bedded down for a great nights sleep on the police station floor. A 43km down hill from Rajan saw the topography change from lush green mountains to a dry river canyon, still this took us a couple of hours as we stopped at almost every switch back to photography each other getting gnarly amongst the cactus. Along the valley we then began a climb which would take us 2 full riding days in total. 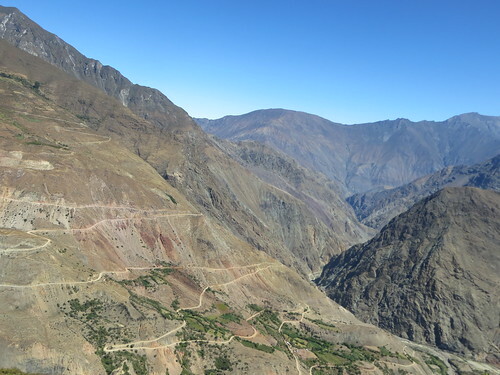 Car count that day was 1, so strange yet amazing that a track like that exists in such tough terrain, god bless Peruvian civil engineering (a sentiment we would continue with as we journeyed south, they built great unpaved roads that are barely used, so much to our advantage). We reached some thermal springs where we were allowed to sleep indoors. It always gets me how these natural springs exist in abundance in Latin America amongst the volcanic rocks, yet what people do is build indoor communal bath tubs and channel the water into them. That night we bathed in the hot natural mud pool outdoors below the stars before paying to use the pretty grubby bath indoors, it was obvious which we’d preferred. Leaving that morning didn’t come quick enough for Nathan, a strict vegetarian he spent a sleepless night next to a room with rotting animal flesh. 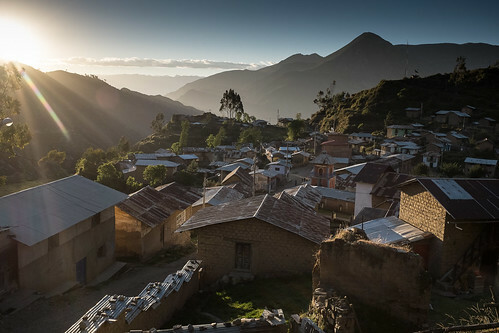 The climb up to Cajatambo was all that you could wish for in a climb, great views, sunshine, long breaks to drink coffee and feast in a surprisingly well stocked shop with beautifully kind locals. We arrived in Cajatambo and settled into some pretty comfortable quarters, not a tough day but this was the last village for a day and a half so the most logical place to stop. We woke that morning, and without any of us leaving our beds we decided a rest day was in order. Listening to my body, rather than fighting it is something I am better at after this time on the road. And so we laid in all morning watching the particularly impressive range of cable channels. During our stay in Cajatambo we watched some great films, the giro de Italia bike race, and great series such as peep show, the office, portlandia and super fun nights. Finally back on the road, we trundled up hill, I think the car count that day was 1, and the views were great but Nathan was not having a good time. He wasn’t fully recovered, which meant a totally miserable day for him. I kept a close eye on him just in case he cycled off the edge of the cliff in a sicky/ altitudey haze. 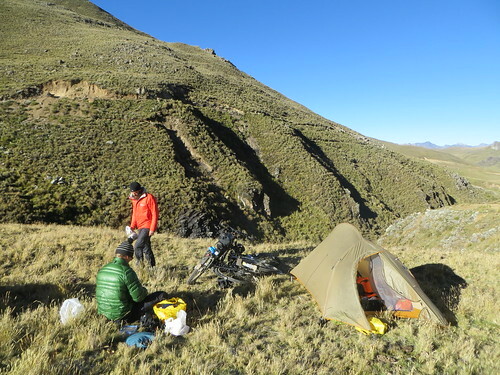 We reached the top of the 4800m pass in the late afternoon and descended to a valley, setting up camp next to the river. Low moral was elevated by cups of coca leaf tea (this really helps with altitude). I hibernated in my tent that evening, it was incredibly cold outside and by 6pm frost had settled, I know if I stick around outdoors I’ll feel the chill and find it really tough to get warm again. Jukka heroically made lentil spag Bol. 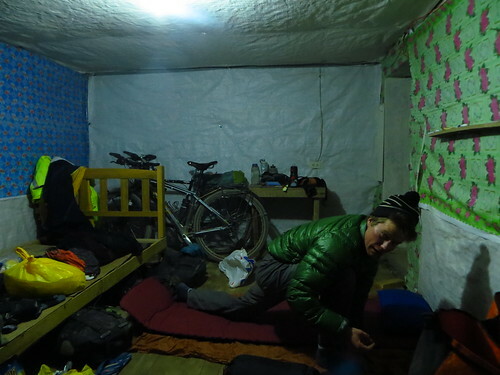 Jukka had recorded on his bike computer lows of -8c (15.8F) that night, but I’d slept pretty snug in my sleeping bag. At this point I should tell readers that there are NO flat parts to this route, so we are spending about 80% of our days trucking uphill. That morning as we approached a mine I saw a little hut at the top of a hill, with a little sign showing it was a shop, there was no one to be seen but barking dogs signaled the people indoors that I was below. Katrina and her mother came running down the hill, as I ran up (holding s\2 to buy some chocolate bars) and I was met with warm hugs and kisses. 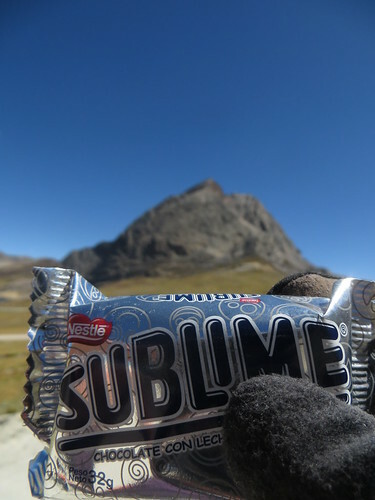 Katrina was even holding 2 sublimes (cyclists staple chocolate bar). I got invited indoors for milk and bread, Jukka had cycled ahead but came back down the hill seeing I’d been distracted. Turns out that the Pikes had spent the night with the family. They’d told us which cyclists exactly had passed by this route- it was only the ones we knew about, Cass, Kirk, Anna and of course The Pikes. This was also confirmed the further we continued on this route. We were the 4th group of cyclists to come this way. The family are 7th Day Eventists and today was Saturday, they told me they couldn’t make any sales so gave me the chocolate bars. We made it to the top of the pass, and made a picnic in front of a beautiful lake. Nathan really wasn’t well, he wasn’t able to eat at all that day and was having to make urgent toilet stops, povrecito. We’d arrived in Oyon on Saturday night, during a huge fiesta in the square. 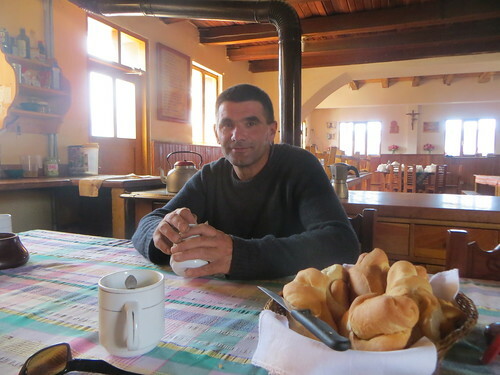 I quickly found a cobbler for my recently broken shoes and trawled the towns ferreterias to find fuel for our stove, before we found a place to sleep as far away from the noise as possible. That day it was clear Nathan couldn’t continue so Jukka and I agreed to continue whilst Nathan would consider finding some proper medical advice, he would then continue on some less challenging trails until he regained his strength. We had to keep moving as time was ticking- the stuff we’d sent on would only be held at the bus depot for 30 days. So sadly we parted ways with Nathan, we hope we get to share the ripio with him again. This was our last cashpoint for a couple of weeks so we stocked up on cash before heading up and out. Nathan has previously been in charge of directions, and now Jukka was taking the reigns (these involve having an altimeter and odometer and following the way point instructions at certain distances / heights). A wrong turn out of Oyon, and then we were back on track, following a steady flow of mine traffic up and up. Another wrong turning meant we rode up a higher and steeper pass than on our instructions, I was finding it so tough, 4961m above sea level. At the top of the pass we where met with such harshly brutal but strangely beguiling views below. 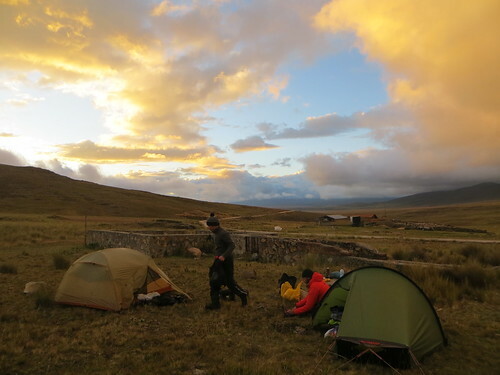 A pretty chilly decent in the late afternoon and we stopped in Rapaz, I was relieved not to wild camp that night as the night chill had caught me on the descent. 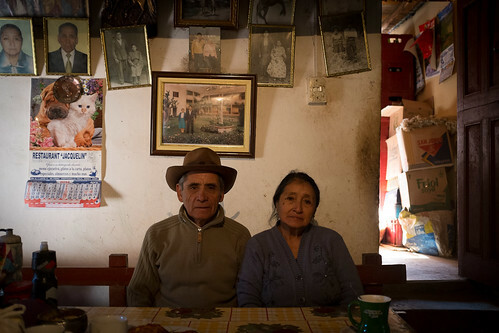 I wanted to eat rice and greasy eggs cooked by an old señora and go to bed under heavy blankets in a grotty hopedaje, which is what we did. So we wandered around Rapaz, taking in the old colonial church, the local people telling us about the quipus kept in the village. 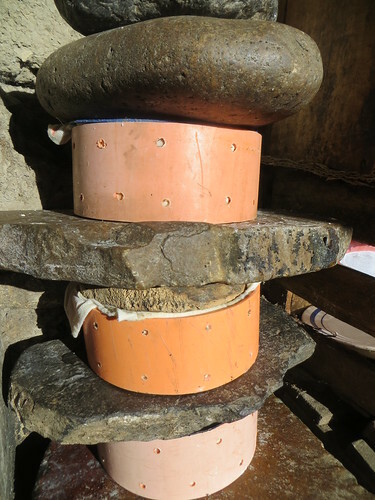 I didn’t know what this was but understood them to be the oldest in Peru. 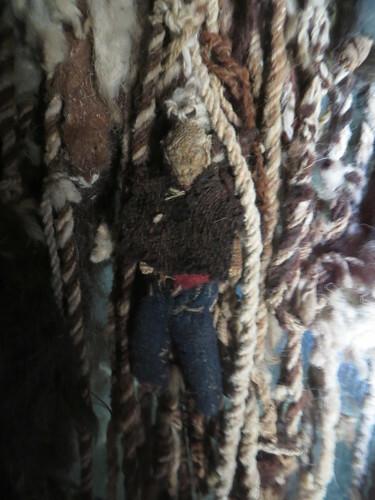 I got taken to a man who I was told guarded them, he then took me to a locked yard, and we went to a locked shed, and then behind a curtain was the glass covered quipus (old threads). I still wasn’t sure what this was about and the guy with the key really wasn’t responsive to my probing. Some other villagers told me it was a mystery. I’ve later read that these are ‘talking knots’, a way of recording historical events. 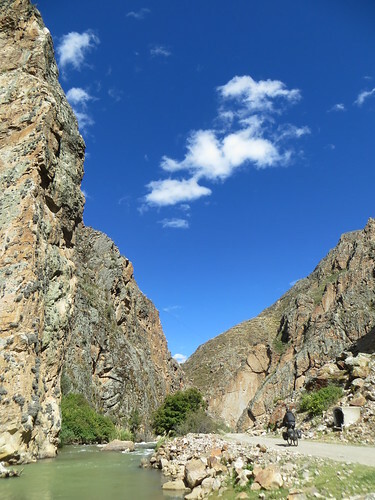 We continued down, wishing we’d camped in this idyllic valley as planned (if only we hadn’t taken those wrong turns the day before) then arriving at some more thermal baths, we would have had a dip but again, they were only indoor private tubs which we didn’t fancy. Still, there was a rather entrepreneurial young girl manning the snack bar outdoors who gave us fresh juice and some vitality giving herb tea. 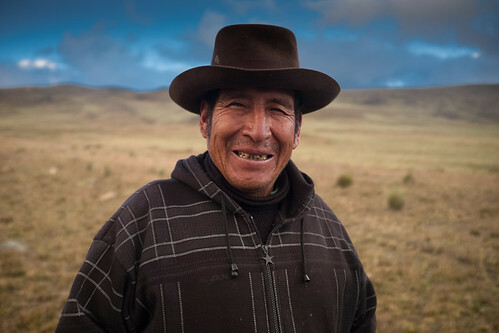 We continued down passing a couple of small villages, we stopped at Picoy where I bought Chicha de Jora (fermented corn drink) which was the nicest chicha I’ve ever had, it was turbo fuel which got me to Parquin in next to no time, I was on fire. 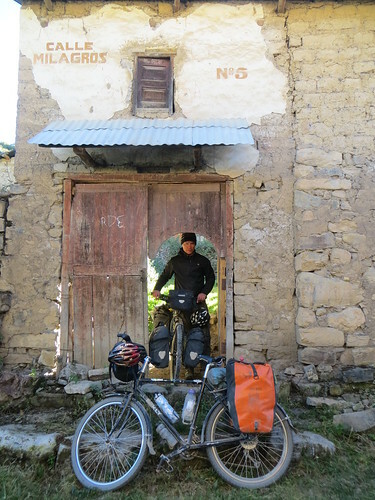 We’d planned a strategically easy day, stopping at Parquin, the final village a third of the way up a climb described as brutal in The Pikes blog. 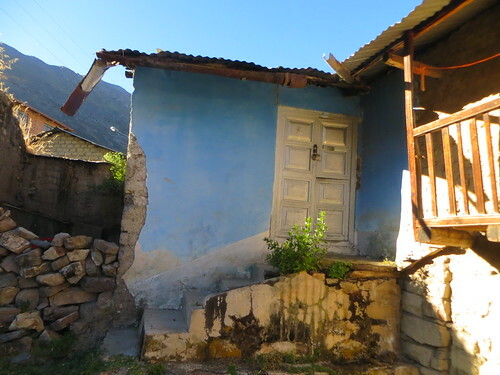 Locals in Parquin shook our hands to welcome us to their village, and we got given a little out house to stay in by a sweet couple who ran the local shop. We had the rest of the afternoon to relax before the señora served us up lentils, rice, eggs and salad. In Parquin we calculated we’d need food for 2 days (we wanted to avoid a detour to a village a few km off route) so stocked up on oats, pasta, and bread, and plums (only fruit in the village) oh, and cheese made by the lady. 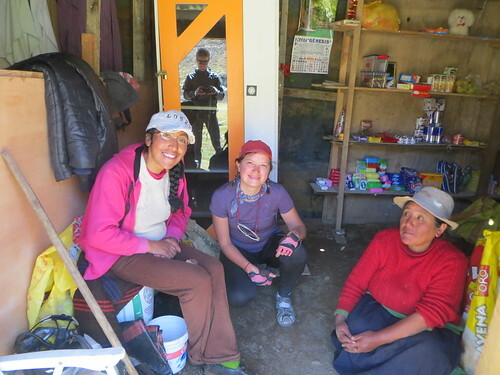 The señora plied me with home cooked fried breads, and sent us off with boiled eggs telling us we needed the energy for the climb. 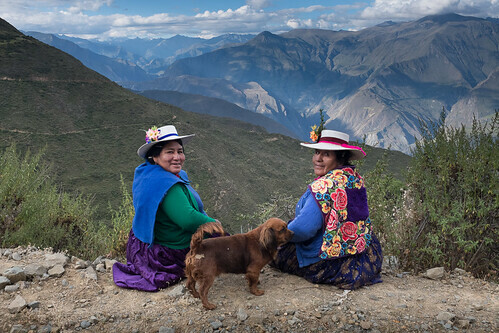 We’d asked the señor how the mountain pass, ‘oh, esta bien’ (it’s fine), that’s Peruvians all over, completely nonplussed by a steep mountain. We settled off on a 1400m of climb, we saw no traffic on this pass at all. It wasn’t as brutal as I’d expected, mainly due to just having so much fun sweating up there on my own (Jukka had left me as he powered on ahead). I ate plenty of sublimes and sugary oats and yogurt (would have LOVED a flapjack so much) to power those pedals. 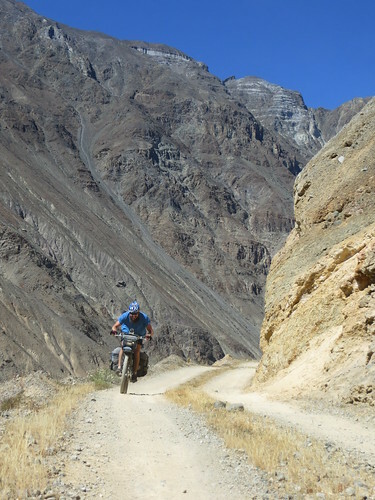 To stay on my bike on such a rocky steep track is a test of balance and agility, then combined with my thudding heart and panting bought on by the high altitude climbing, it was not easy. I would loose my balance and then have to push for a few metres to get to a less steep part where I could mount my bike again. And so another thrilling descent, although delayed by Jukka’s puncture. We always seem to descend in the afternoon as the sun is fading, I get so cold, in all my clothes, I had to get off my bike and do some star jumps until I cold feel my extremities again. We began climbing again in the late afternoon before finding a good camp spot, here I set up camp and crawled into my tent, ate some sandwiches inside my little haven before hitting the hay, I was totally spent. 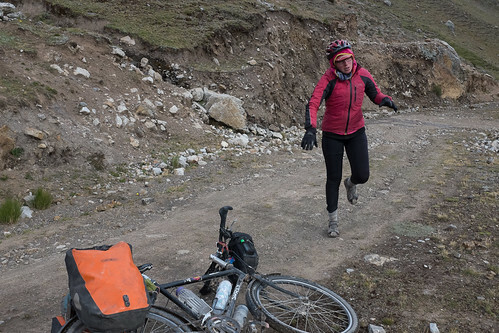 I always think most physical hardships on a bike tour are mind over matter, so that morning when I woke up heavy and slow I told myself to snap out of it. The pass we were climbing that morning was by no means tough, but I just couldn’t find my rhythm. I was busy self loathing at the top of the pass when I mislaid my fingerless cycling gloves. These constant wardrobe changes to accommodate the ascending and descending makes it easy to forget stuff. It wasn’t until we started the next climb I realised I’d left them behind at the top of the mountain, and I was too tired to go back up. I know they’re only gloves but I loved them, I’d had them for 6 years and were a gift from someone dear. 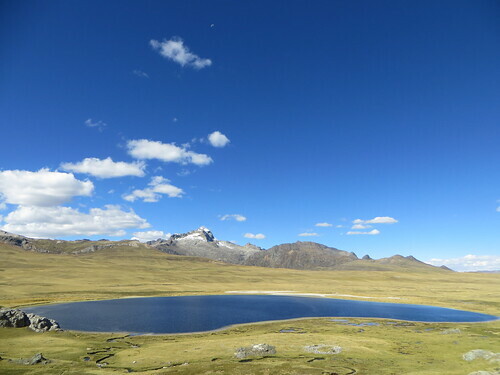 We passed a beautiful lake before a short pass, and then down before I called it a day, setting up camp at 4700m. 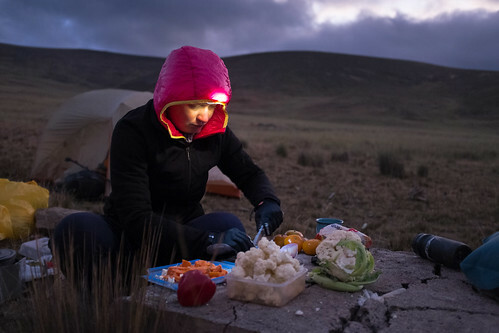 I’ve perfected keeping warm whilst cooking dinner by sitting in my sleeping bag and drinking coca tea, happy camper. Again, an even colder night, but I’d been cozy, creating a small breathing hole in my sleeping bag, if my face was outside of the bag I couldn’t sleep, it was too chilly. Still the altitude made it hard to sleep and when I did I had the most crazy dreams, common due to the lack of oxygen. We’d purposely chosen a spot where we knew the sun would hit early in the morning, so it was a pretty chipper morning and I was feeling tones better than the day before. We were running low on food and we were moving well when we arrived at a little wooden house, labelled as a shop, our instructions had not told us this place existed and sure enough it had only been open a month. I quickly inhaled 3 sublimes, followed by coffee and greasy fried egg butties, while Jukka had fried trout and rice for only 5s (£1). 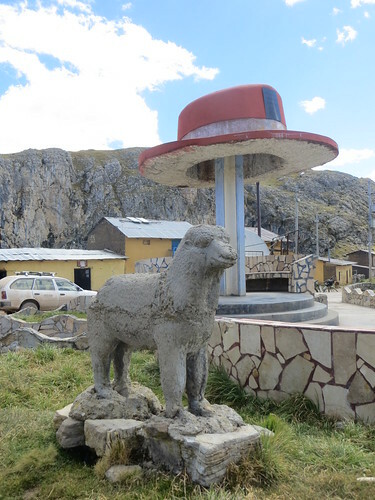 Glorious riding to Yanta with it’s incredible concrete hat statue. Living in London, a true concrete jungle I crave nature, so I got thinking if here in such a wild place people just crave the opposite. 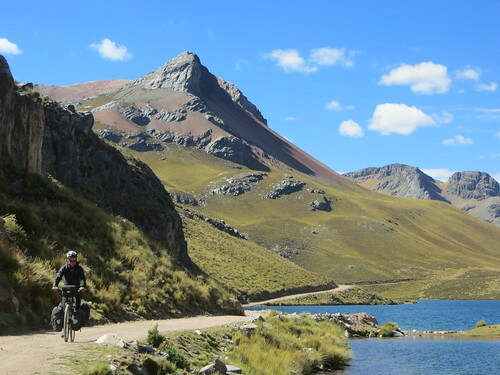 More stunning lakes truly spoiling our eyes before arriving in Marcapomacocha. 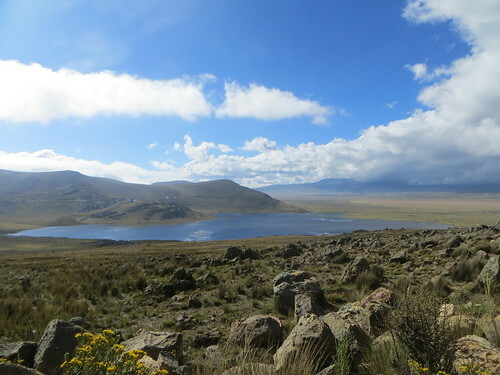 We worked out that the stunning lake seems to be a reservoir serving Lima, the whole route that day was lined with concrete channels taking water down to the capital. We took some rest days here. 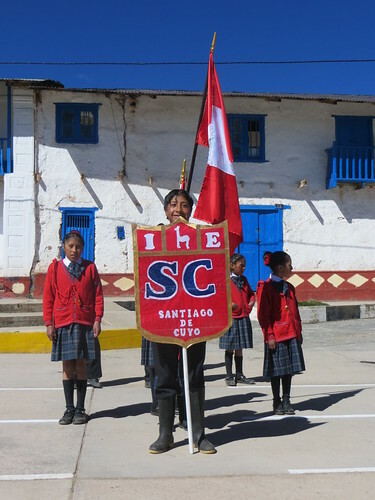 6th June was Flag Day in Peru, a national holiday and here in the village all the school kids were out doing a very militaristic parade of the square. We were a bit of a tourist attraction, can’t imagine many gringos pass through here, so all the parents and school teachers lined up their children one by one to have their photo taken with me. I felt like the decorated llama you see in tourist attractions. One little girl was too scared to get close to me, and was kicking and screaming, haha! I will not include any pictures of myself as it was laundry day so I was wearing waterproof trousers and my down jacket, I looked like a failing Russian winter olympiat. Great write up! 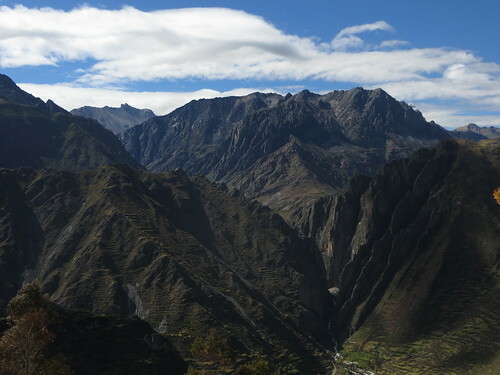 I’m looking forward to hitting the Peru Great Divide on my way north. 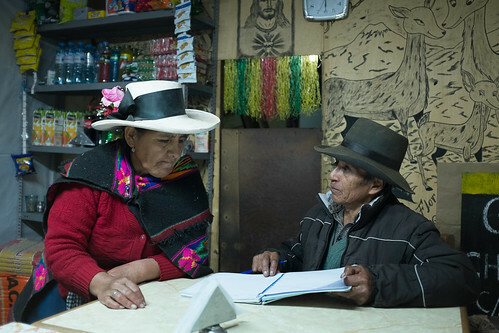 Hopefully catch you guys coming south through Bolivia. Cass and I are headed north through Argentina at the moment. Nice pics and write up! 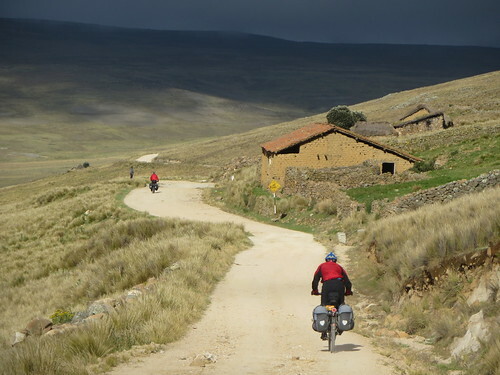 I’m looking forward to hitting Peru and riding the divide. I’m headed north with Cass at the moment. I guess we’ll see you guys on a dusty road in Bolivia. Thanks Mike. An incredible ride! And I hope we get to crossing paths. 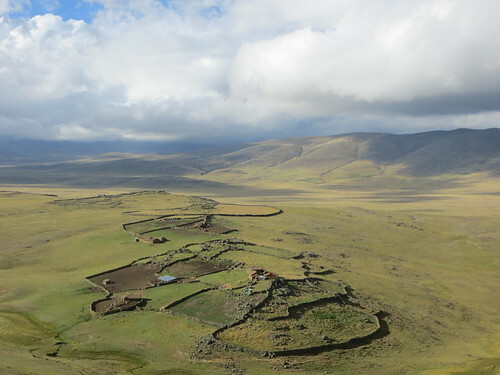 Such stunning landscapes, clear air, endless light. 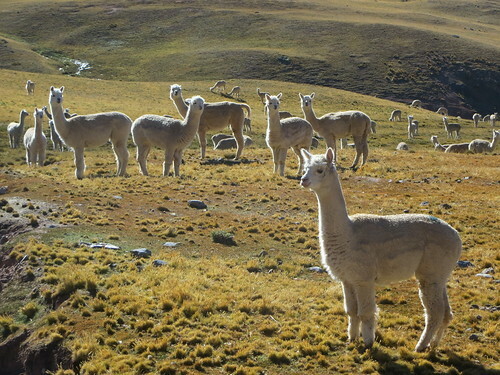 Astonishing to think that a city of 15,000,000 people who’ve never seen a llama lurks just a few mountain ranges over the horizon. Well done on using your mind-over-matter technique to get on equal terms with the cold and altitude. No small task. 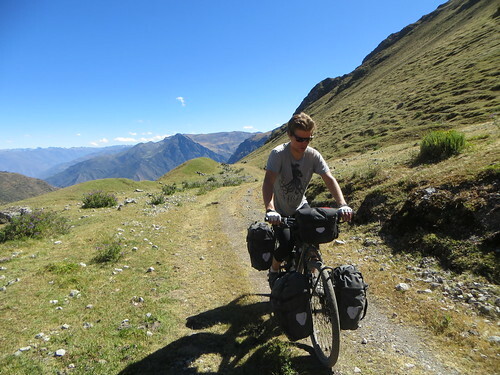 I borrowed your attitude to feel less overwhelmed by big climbs and have even been enjoying them in Ecuador (particularly the ones on loop rides with minimal kit, carried by Will! Oh, the feeling of flying). 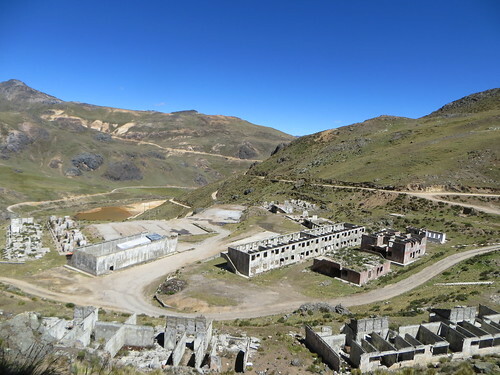 We are in Pasto now, both a bit under the weather. It’s a good time (football to watch) and place (our room has one of those old wooden balconies) to rest up and do some route-planning. PS Lost both my treasured Paisley buffs at a lavanderia so sympathise with glove loss. Ruth, great to hear from you! I’m sorry about your beloved buff (I have a paisley one also). I hope you guys feel better soon, although sort of a shame you are stuck in Pasto, although quite pleasant it felt so much more chilly than the other places we visited in Colombia. 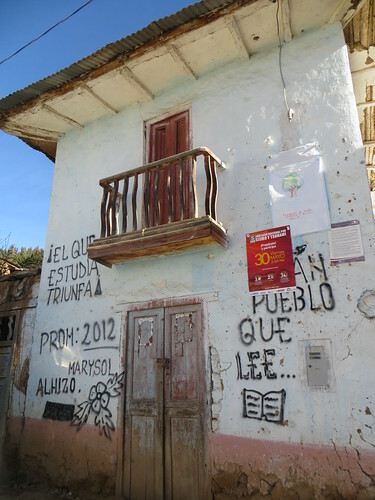 Been loving your recent blogs – those pictures of Colombia winning! I loved Will’s write up of the loop and thought about Alex eating all those sublimes and 7 sandwich second breakfast. Good work on crushing those climbs. Things will only get more fun in Colombia, a country I miss every day. Helo, i will make this Trip, do you have the route written pont by Point. 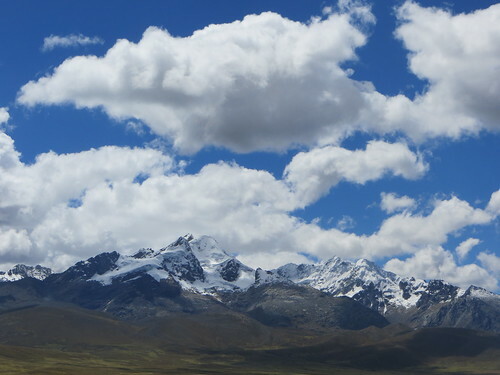 I would take it from Andes By Bike, But they are off. Also, i would apreciate if you send to my e-mail the gps of the second part of the Trip, starting at Carreteira.